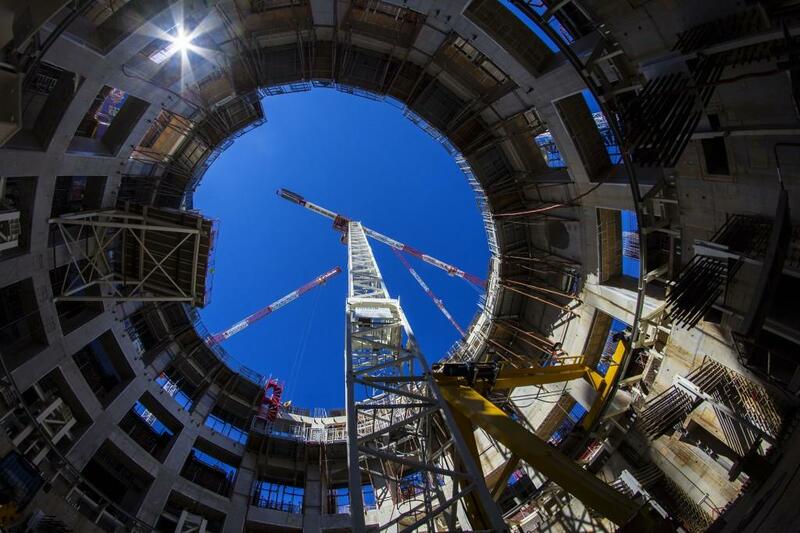 ITER's steel-and-concrete bioshield has become the defining feature of Tokamak Complex construction. Two levels only remain to be poured (out of six). 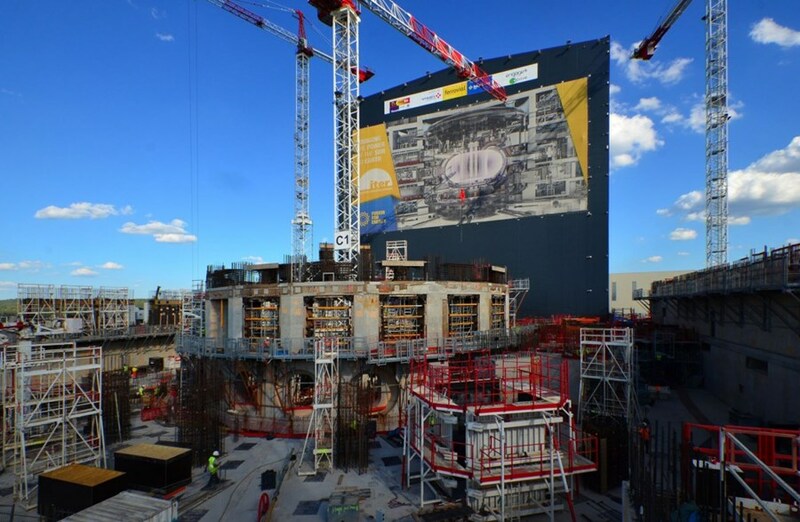 The ITER bioshield, centre, and the Diagnostics Building, right, have both reached L2 level and work is underway on L3. 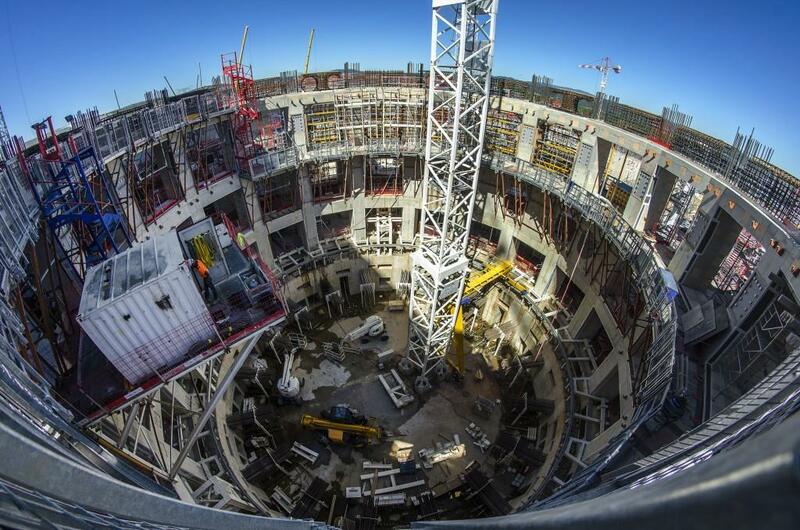 Approximately 400 workers in two shifts are in involved in Tokamak Complex construction. It is a "ring fortress," with walls up to three-metres thick, that will completely surround the Tokamak and protect workers and the environment from the radiation generated by the fusion reaction. Over the past year, we've seen the walls rise steadily. Six months ago, part of the first above ground level (L1) could be seen and work was starting on L2. Today L2 forms a complete ring, the first pours are underway for L3, and some rebar elements have already been installed for top level L4. 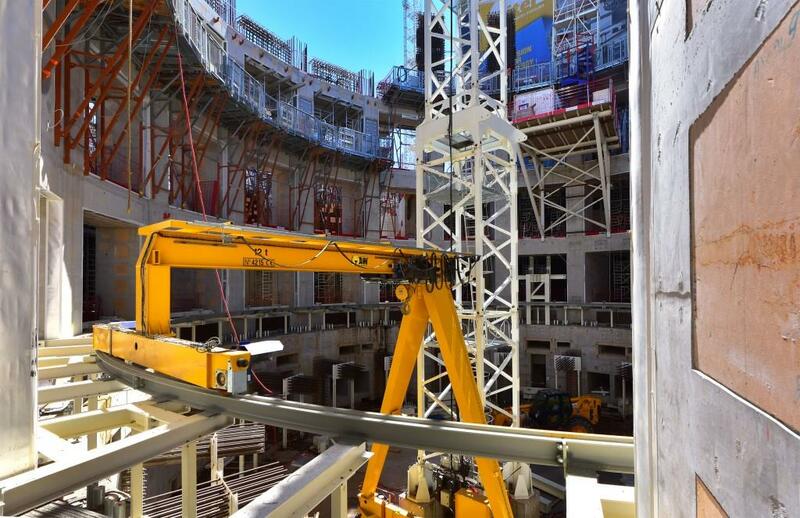 The gantry crane that is installed on the floor of the machine installation pit is neither the most powerful nor the most spectacular of all the ITER lifting devices. It doesn't rise to vertiginous heights like the worksite tower cranes nor does it loom high above the floor like the double overhead bridge crane of the Assembly Hall. It has been specially designed to travel in a perfect circle at the bottom of the machine assembly well (B2 level). Its mission: to lift and deliver the loads for the construction of the concrete crown that will support the combined mass of the cryostat and Tokamak (23,000 tonnes). 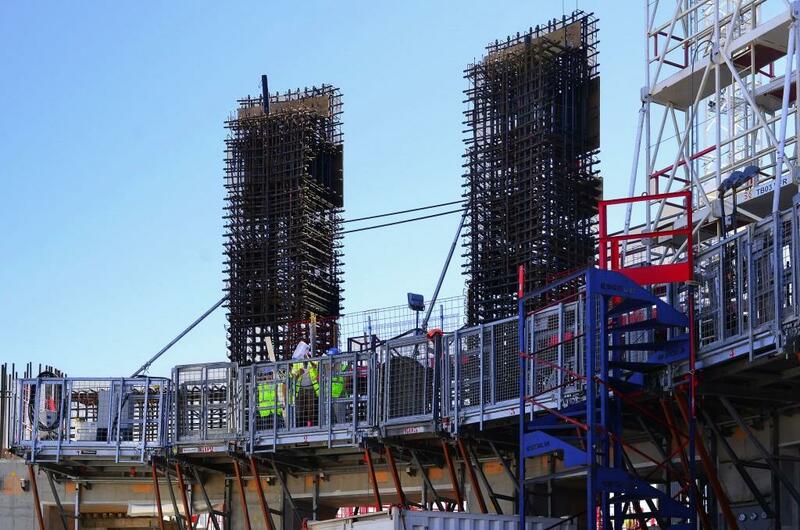 The central bioshield is evolving rapidly: the steel rebar in this picture already belongs, in part, to the final L4 level—the last of six levels for this circular "fortress" that will enclose the ITER Tokamak. Unlike the others, this top level will be unbroken by access penetrations. When the first-phase assembly of the machine is complete, the bioshield will be capped with a concrete lid. Four completed levels of the ITER bioshield are visible in this wide-angle photo, from the lowest basement level B2 through B1, L1 and finally L2. 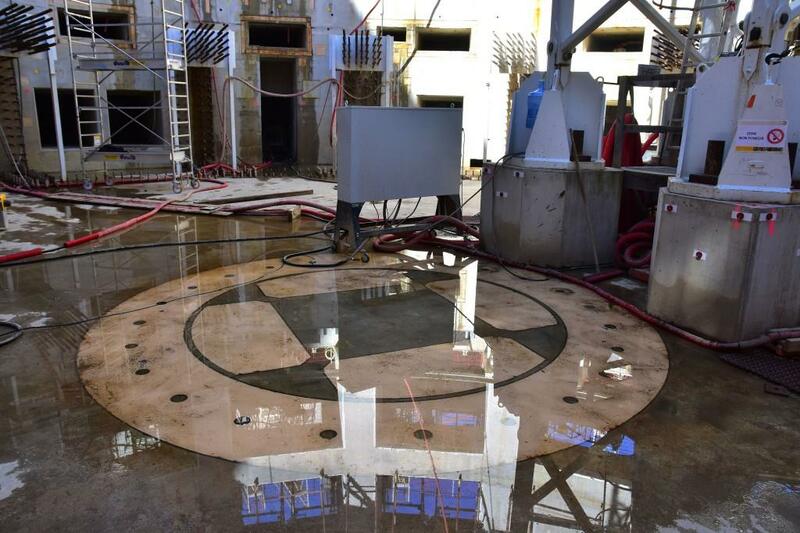 The single heaviest machine component—the 1,250-tonne cryostat base that is being assembled now in an on-site workshop—will sit at the bottom of this assembly pit on a concrete crown that has yet to be realized. The early morning sun shines through one of the penetrations of the ITER bioshield, symbolizing the "star" that will be born when deuterium-tritium operations begin in 2035. The newly installed gantry crane (yellow) and its circular track are visible on the right side of the image. The crane, with a lifting capacity of 12 tonnes, will move around the well, circling the white tower crane that will of course remain in place. To the left, the overhanging platform is a workshop that will be used for the installation of a temporary lid at the B1 level; as work on the upper levels of the bioshield progresses, the lid will protect personnel at the floor level constructing the cryostat support crown and the radial walls. But as a result, this particular full view of the assembly arena will soon no longer be possible. Of the 115,000 embedded plates in the Tokamak Complex, this set of five (in beige, including one large circular plate) is unique. Located in the very centre of the machine assembly pit, with 48-millimetre-thick studs reaching more than one metre deep into the basemat slab, the set will anchor the main tool of the assembly period. Called the central assembly column, the tool has a steel backbone and seven radial beams that will stabilize the vacuum vessel sectors (5,000 tonnes total) during assembly and welding. Once its mission fulfilled, the tool will be removed and the central solenoid magnet will take its place.